The Prime Minister of Israel, Benjamin Netanyahu wants to meet Prime Minister Voreqe Bainimarama. He showed his intention in a letter written to the Prime Minister. 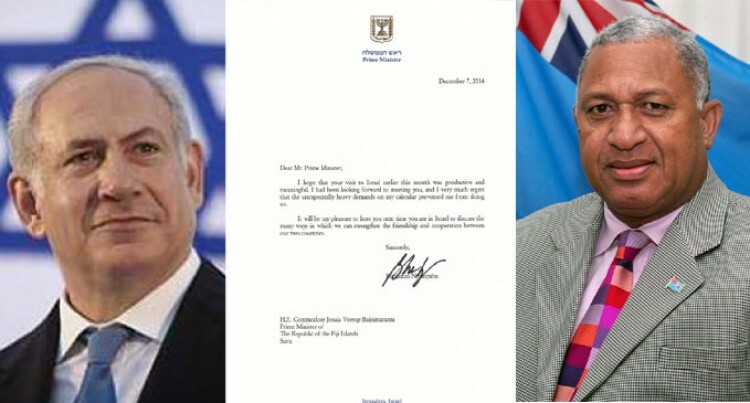 In the letter, he revealed that he had looked forward to meeting Mr Bainimarama on his recent visit to Israel. However, he said during the visit he had unexpectedly heavy demands on his calendar that prevented him from meeting with him. “I had very much regret that the unexpectedly heavy demands in my calendar prevented me from doing so,” Mr Netanyahu said in the letter. He added that it would be his pleasure to host Mr Bainimarama when he would be in Israel the next time. In that meeting, Mr Netanyahu said they would discuss the many ways, in which they could strengthen the friendship and cooperation between the two countries. He said he hoped Mr Bainimarama’s visit to Israel earlier this month was productive and meaningful. the Israeli Foreign Minister, Avigdor Lieberman. They agreed to strengthen existing bilateral ties in various areas and discussed new areas of cooperation between Israel and Fiji. The meeting came after the Prime Minister visited Fijian troops serving with the United Nations Disengagement Observer Force (UNDOF) in the Golan Heights separating Israel and Syria.